Oh, maybe Grabcrabs! They might pop out and steal a random item from your inventory, and then they’d run away and you’d have to chase them to get your item back. I know I'm a bit late but I think that a lot, if not all, vehicles will be in the dlc and go in the cold zones because I think it would be stupid that they can go in volcanic zones but not in artic ones. How I see it is that there will be an upgrade needed for the old vehicles to get in the artic and we will need more than one to get deeper but the new vehicles will not need them straight away we will be able to use them for a while before we die of freezing. Also the new vehicles could have functions that the old ones don't have and the other way around so that we need some of the older vehicules. There could also be new weapons or upgrades for te knife and "freeze gun" gun (sorry I have not played for a while and do not remeber the name) that would make them better at defending ourselfs. I just wanna remind you that this is my vision of how things could get cooler not something I read somewhere so it's not accurate... unfortunatly. @Snoutchi First off, it’s not a DLC. It’s an Expansion completely separate to the main game so there won’t be any means of carrying over vehicles. I trust the Devs will have a good ingame reason for this, probably something along the lines of “Since they knew what to expect, they got vehicles more tailored for the mission” as shown by the confirmation of a terrestrial hovercraft, which would be mostly useless if they weren’t planning to get on the surface and explore the arctic. The Seamoth is both a sea and space vehicle, and isn’t dedicated for either one, which is why it can’t go very deep. Why they’re replacing the Cyclops is unknown but if the Expansion gets a similar submarine it’ll probably have built-in features useful for the Arctic, which is better than just building cyclops upgrades. And since the prawn is already well-suited to 4546B in general, it stays in. It’s not that they’re unable to go through arctic zones, thought this is within the realm of possibility. It’s possible they wanted vehicles with more insulation to protect their pilots. It wouldn’t harm the subs but it’s still possible to get frozen to death. Also, with the existence of Leviathans being known and the capacity of the smallest predatorial leviathan known to destroy a Seamoth without effort, they wanted a safer small sub. It will probably be similar for the Cyclops, because with so little of the planet being known who KNOWS how big life can get. Upgrades for existing stuff is certainly within the realm of possibility but no guarantee on what we’ll get and what we won’t. They could cut out some tools as well in exchange for new ones, because this IS a dedicated mission with the intent to get people down on the surface of 4546B, so with information gathered by Ryley, they’ll know what to expect. Plus, it’ll be fun to have new vehicles. It changes up gameplay, even if only a little, and keeps the Expansion fresh, new, and different from the base game. I think that a lot, if not all, vehicles will be in the dlc and go in the cold zones because I think it would be stupid that they can go in volcanic zones but not in arctic ones. For me, a gnarly ridge-backed 'Ice Breaker' sub of about Cyclops size would be very welcome. Building this around mid-game might allow you to break through an expansive ice shelf to finally access the surface ice biome. From there you'd build your hovercraft to zoom past the leviathan surface stompers to reach new areas where you can dive again - perhaps after building some other kind of vehicle that can drill down from the surface. [How to] the new vehicles will not need them straight away we will be able to use them for a while before we die of freezing. We know that a thermal biome will be included. So your game might start out with you venturing out from a safe warm zone. In the first Subnautica, much of the game involved finding tech to allow progress by diving deeper. In the Arctic Expansion (reputed to be huge) travel could be more horizontal by finding tech to dive colder. How cold could it really get? 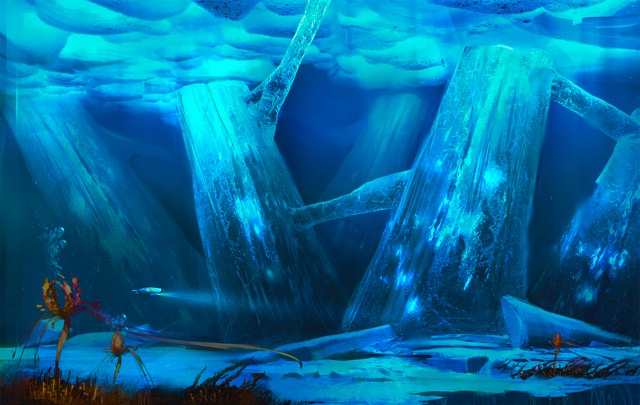 Judging from that great bit of concept art posted by @RowletAlex, the sea could be progressively freezing towards becoming a solid block, the further you travel towards your final goal at the Pole. We know from early versions of the base game that the Devs wanted to include terraforming. So maybe the final stages of an Arctic game would involve building a craft with a heat beam that could carve its way through. @RowletAlex Yeah, I didn't quite understand why they made the expansion that way and I just assumed it would be a part of the game. Appart from that I'm 100% agreeing with you! @BlueBottle Well, yes, I love how you see the new sub and the heat beam is a great idea. For the hypotermia I really think that the devs will include it in game because when we go too deep in the game we can die of... well being too hot, so it would make sense that they put something similar for hypotermia in the artics. It appears to be an arctic version of the Kelp Forests. Looks super cool IMO. Again I’m still wondering if we’d get like a seamoth mk4 or something for the cold environment. And a new prawn suit cause we already know it’s probably gonna be in the game and plus it’ll be set in the future so maybe it’ll be prawn mk5 cause it’s currently mk3 right.